Every once in a while Phil finds a recipe, sends it my way with a little comment: I think we-you should make this. His source is almost always the NYT Food section. I subscribe to that too, but confess to almost never clicking on it. I’m usually absorbed by my mile-long list of stuff I want to make. Soon. Anyway, last week he sent me a link about these chocolate chip cookies endorsed (with enthusiastic ravings) by Dorie Greenspan. You know, royalty in the food world. I made them that same evening, and into the fridge they went, for a mandatory period to mature the dough before baking. The dough contains a fair amount of rye flour. And poppy seeds. And dried cranberries. And chocolate chunks. A sprinkle of Maldon sea salt on top, a step that often makes me roll my eyes to the ceiling (like avocado toast does). But, trust me. It works. These might be the best choc chip cookies I’ve ever made. Working with a mixer beat the butter and both sugars together on medium speed for 3 minutes, until blended; scrape the bowl as needed. Add the egg, and beat 2 minutes more. Turn off the mixer, add the dry ingredients all at once, then pulse the mixer a few times to begin blending the ingredients. 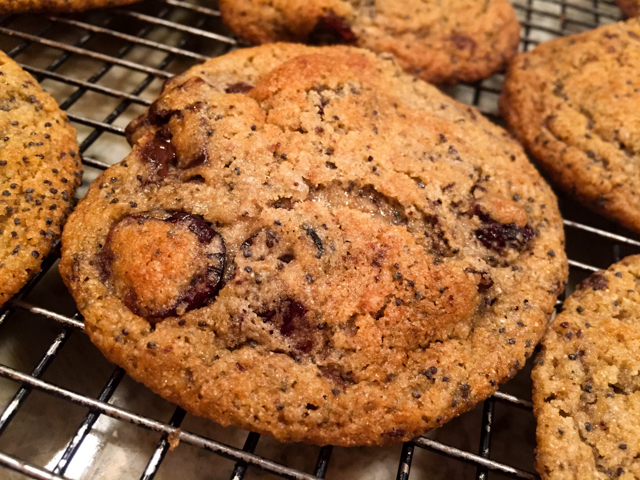 Beat on low-speed until the flour almost disappears, and then add the poppy seeds, cranberries and chocolate. Mix only until incorporated. Scrape the bowl to bring the dough together. Have a baking sheet lined with parchment, foil or plastic wrap nearby. Divide the dough into 15 pieces (I made 16), roll each piece into a ball between your palms and place on the baking sheet. Cover, and refrigerate the dough overnight or for up to 3 days. When you’re ready to bake, center a rack in the oven, and heat it to 425. Line a baking sheet with parchment paper and arrange the cookies on the sheet, leaving 2 inches between each cookie. Sprinkle each cookie with a little flake salt, crushing it between your fingers as you do. Bake the cookies for 10 minutes, pull the baking sheet from the oven and, using a metal spatula, a pancake turner or the bottom of a glass, tap each cookie lightly. Let the cookies rest on the sheet for 3 minutes, then carefully transfer them to a rack. Serve after the cookies have cooled for about 10 minutes, or wait until they reach room temperature. Comments: These are simply amazing. They are complex, they have sweetness and sourness, they have a hint of salt, and they are addictive. I inhaled three. Me, the Self-Proclaimed-Moderation-Queen, had three cookies. Don’t let their humble looks fool you, they stopped Dorie in her tracks (her own words), and they will stop you too. Make sure you have friends, co-workers, family members to share, because there’s not enough aerobics in a day to counteract the damage you can inflict upon yourself if left in a room with a full platter of these babies. You’ve been warned! Ok, you got me Sally. I’m trying these by the end of the week! After all I’ve got everything and don’t even need to go to the store, how could I say no?! you will fall in love with these, I guarantee it! Now I have to add this recipe to MINE mile-long list of staff I want to make!!! These sounds fenomena! Thanks for sharing! So “by we I mean you” happens at your house too? When it happens here the speaker is frequently not even remotely capable of doing what “we” should do. I would much prefer a straightforward request. I know…. those were so great too. I guess if I had to decide between those and today’s…. wow, tough choice. I think I will pick today’s version because it’s so “different” – you know, funky and delicious. but what I should do is bake two batches and taste them side by side! HA! I have actually made rye chocolate chip cookies (after toasting the rye, how’s that for roll your eyes avocado toast fussiness?) 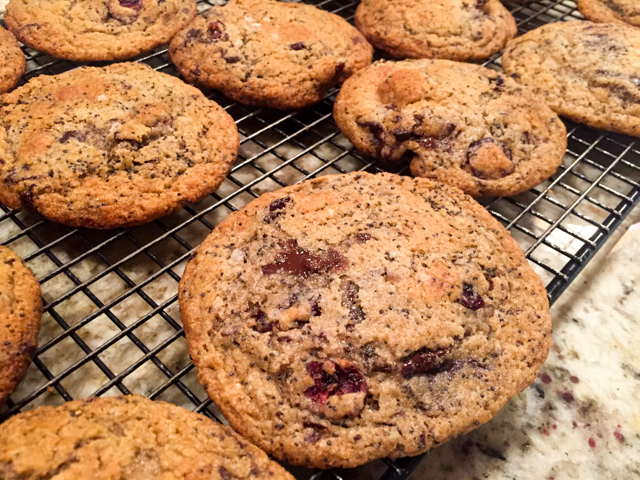 and loved them, but the addition of poppy seeds and the cranberries is calling my name. These are gorgeous! Great photos! I’ve made these twice to much acclaim..trying to get organized for Thanksgiving dessert tray: do you think the raw dough balls could freeze well, to be baked off fresh…would really help to take the balls out night before and bake off the morning of!? thanks ! Awesome to know they worked well for you too! You know, I think you can definitely freeze and bake later. It would make your life a lot easier for Thanksgiving! thanks! I’m going to give it a try…I think most frozen dough baked off fresh is better than freezing the baked cookies…these should be no different! totally agree with you there! fingers crossed for you!